A winter trip to Banff and Lake Louise has been on my travel bucket list for as long as I can remember. 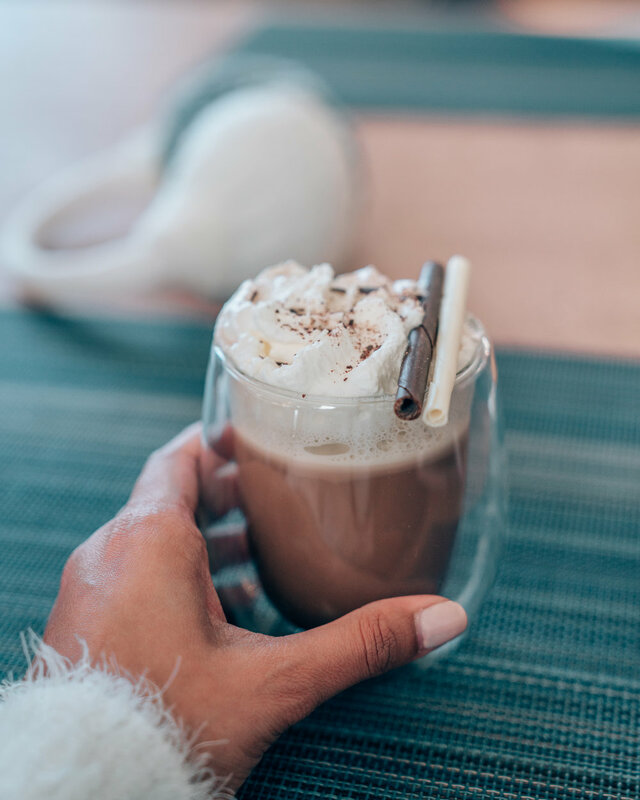 After scrolling through hundreds of photos of the stunning snow-covered landscapes, there was something so magical about exploring frozen lakes, sipping hot cocoa and trying an abundance of snowy activities that intrigued me. So when I received an invitation to experience winter in the Canadian Rockies with Travel Alberta, I knew it would be an epic adventure! I traveled to Banff in February with Jessica from A Passion and A Passport — it was our second time meeting each other, but since we ironically share a birthday and a love for all things travel, we knew we would be two peas in a pod! I’ve never been one to seek out winter destinations (in fact, you’ll often find me escaping to a beach this time of year), but Banff completely converted me! I finally conquered my fear of driving in the snow and learned how to properly dress for negative degree temperatures. As you can tell, it didn’t take long for me to fall completely in love with this winter wonderland. I was — literally & figuratively — blown away by the beauty of winter on this trip! Banff National Park is located in Alberta, Canada along the TransCanada Highway. Calgary International Airport (YYC) is the closest airport. Once you arrive into Calgary, you can either rent a car and drive or take a shuttle to Banff. By car, Banff & Lake Louise is a scenic 90 minute drive west of Calgary. We were both extremely nervous since it was the first time either of us would drive in the snow, but after a quick Google search on tips for driving in the snow (and lots of positive reinforcement from one another) it felt completely doable! The TransCanada Highway is open year-round and we found it to be safe, clean and well-maintained throughout the winter months. Though you could opt for shuttles, taxis or buses to get around Banff Town, in order to make the most of your trip and allow for flexibility in your itinerary, I highly recommend renting a car to explore Banff and its surrounding areas. When renting a car in the winter months, make sure to get a vehicle with all-wheel-drive (AWD) and snow tires. Driving in snowy conditions can seem daunting at first, but trust your instincts, follow safety precautions (seriously, read these tips for driving in the snow), drive slowly and give yourself plenty of time to get from place to place. To enter Banff National Park, you will need to purchase a Parks Canada Pass (this pass gives you access to many other Canadian national parks, conservation areas and historic parks too — it’s perfect if you plan to extend your trip and explore more of this beautiful country!). 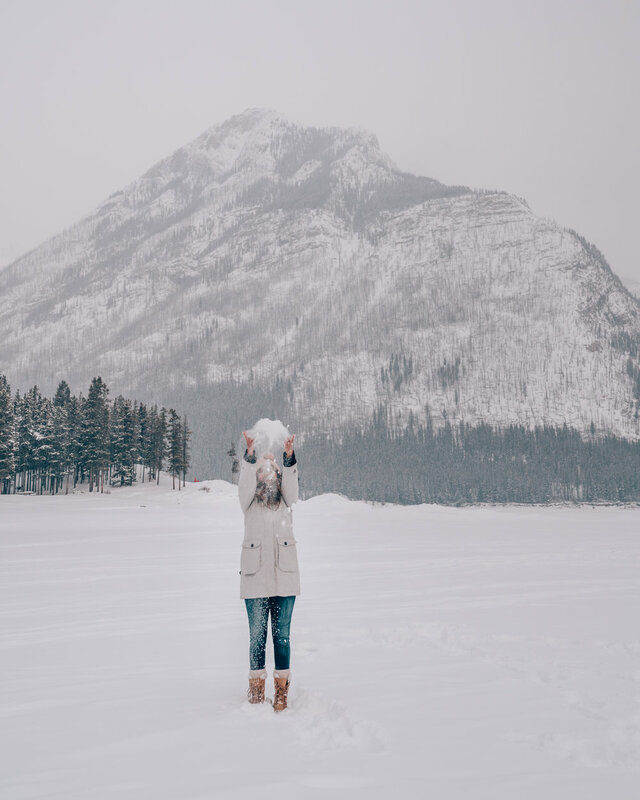 If you’re visiting Banff & Lake Louise in the winter, here’s a quick recap of my 5 Day Itinerary to help plan your trip! Fly into Calgary International Airport (YYC): Jessica and I flew from San Francisco (SFO) into Calgary, which is a quick nonstop 3 hour flight. As soon as we touched down in Canada, the first thing I had to do was get my Tim Horton’s fix: coffee and chocolate Timbits! Check In, Unpack & Dinner: We checked into our room at the Banff Centre , ate a quick dinner at the MacLab Bistro on site, unpacked and prepared for our first full day of adventure. Our room had an artsy vibe, cozy beds and gave us a beautiful view to wake up to each morning. It was also conveniently located just a 7 minute drive from Banff Town (making it easy to grab coffee and breakfast each morning) and the staff was beyond friendly and helpful in sharing tips and advice as we planned out our days’ adventures! Breakfast & Coffee @ Good Earth Coffeehouse — What to order: They have a variety of breakfast sandwiches and pastries to help you start your day! I also had an almond milk flat white and it was on point! Lake Minnewanka: Walk on top of the frozen lake with a stunning view of Mount Inglismaldie as the backdrop. I loved that this lake wasn’t overly crowded, while still being incredibly breathtaking. Lunch @ Communitea Cafe in Canmore — What to order: I got the Yoga bowl with smoked salmon! Breakfast & Coffee @ Whitebark Cafe — What to order: The homemade granola bowl with yogurt & berry compote was delicious and perfect to fuel up for a day of adventures (I even came back here on our last day and got a bag of the granola to take home!). The coffee at Whitebark was my favorite of all the coffee shops I tried in Banff Town. Spend the day at Lake Louise: With so much to see and do, you can easily spend an entire day here, like we did. The Fairmont Chateau Lake Louise sits atop Lake Louise, offering breathtaking views and winter activities to keep you busy all day long! Dinner in Banff Town: Bear Street Tavern for pizza — What to order: Any of the pizzas & a glass of red vino to wind down! Breakfast & Coffee @ Wild Flour Bakery — What to order: Famous for their fresh baked bread, try any of their breakfast toasts. They also make a lovely flat white! Helicopter Tour with Alpine Helicopters: See Banff from above and take your love for this snow-covered town to new heights! TIP: I recommend booking your helicopter tour towards the beginning of your trip — our first scheduled flight was cancelled due to weather conditions, so you want to leave ample room to rebook on another day if necessary. Johnston Canyon Ice Walk: Chase frozen waterfalls with a quick “hike” to the magical Johnston Canyon. We walked to the Lower Falls (which took about an hour roundtrip, mostly because we stopped often for beautiful photos! ), but if you have more time, definitely check out the Upper Falls as well! The distance from the parking lot to the Lower Falls is 0.5 miles and to the Upper Falls is 1.5 miles. Banff Upper Hot Springs: Soak in the incredible views & relax your tired muscles in the steamy hot springs for under $8 CAD. They give you access to a full size locker to store all your belongings and even rent out swimsuits in case you decide to make an impromptu trip here! I was so terrified to go outside without my puffy winter coat, but they’ve done an incredible job with designing the place, so you can hop in and out without much trouble. TIP: Go an hour before sunset for day-to-night views! Fondue Dinner @ Waldhaus Restaurant at the Fairmont Banff Springs: This was easily my favorite meal of the entire trip! What to order: Carrot salad, truffle cheese fondue & the chocolate fondue dessert — the best comfort food after a busy day of exploring! Treat yourself to a morning at the award-winning Willow Stream Spa at the Fairmont Banff Springs (even if you are not a guest of the hotel, you can book a spa service or purchase a day pass for $79 CAD to enjoy the amenities, which include heated mineral pools & a hot tub surrounded by scenic, snow-capped mountains!) — it’s the perfect place to rejuvenate before heading back to reality! Stop for BeaverTails before you hit the road: BeaverTails are a yummy Canadian dough pastry (they are stretched out and resemble a beavertail, hence the name). They’re served hot and and topped with a variety of toppings: cinnamon, maple butter, reese’s pieces and — my favorite — chocolate hazelnut! 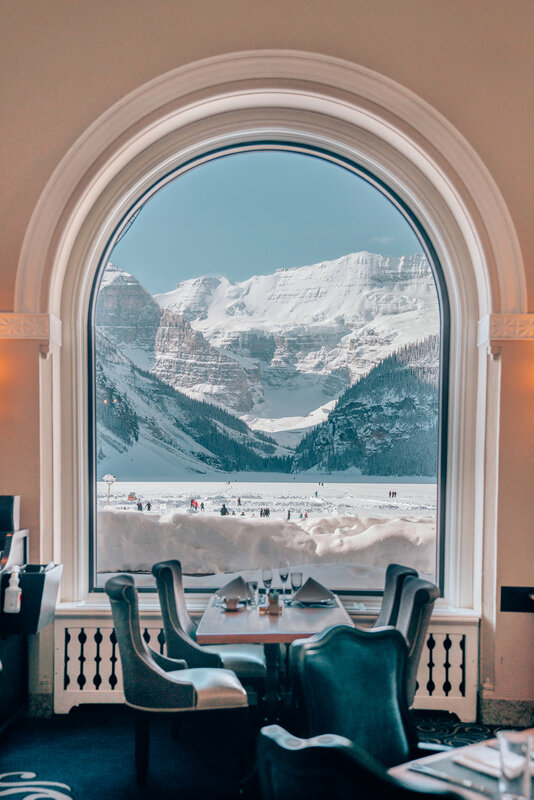 I had the most incredible time exploring Banff and Lake Louise this winter, and I hope I have convinced you to visit and check this beautiful winter destination off your travel bucket list too! 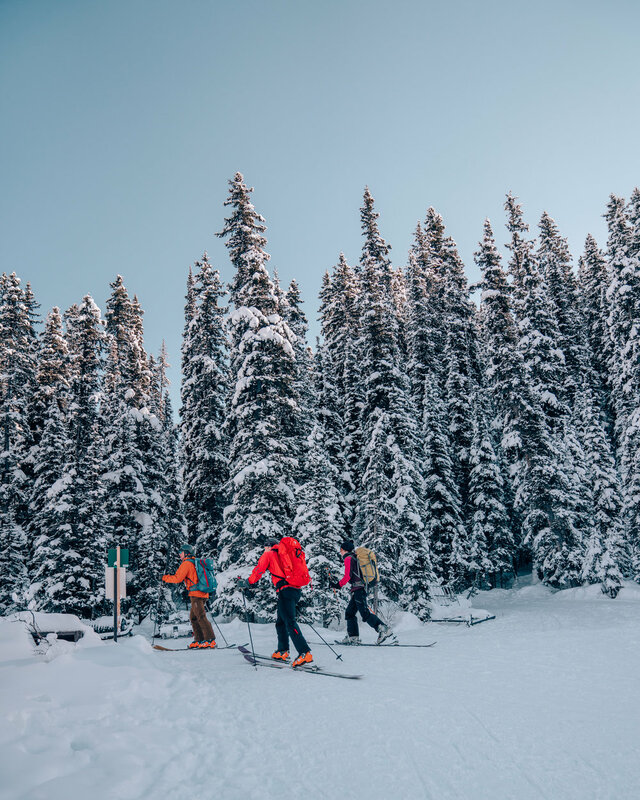 You will be pleasantly surprised at how much there was to see and do during the winter months, even if skiing or winter sports aren’t your thing. After spending a few days in Banff, I already cannot wait to come back and explore even more of Canada next winter! I was invited to explore Banff & Lake Louise with Travel Alberta and Banff Centre for Arts & Creativity.